Dimensions (HxWxD): 1.5" x 1.1" x .45"
This one of a kind 1.5 inch high Polished Striped Ametrine Pendant by Lawrence Stoller, weighing 25 grams or .88 ounce was created by Lawrence Stoller, critically-acclaimed artist and crystal cutter who is known world-wide as a fabricator of magnificent works of art created in partnership with Nature & Light. This amazing Ametrine pendant displays clearly demarcated zones of purple, gold and violet that mark this beauty as a AAA quality specimen. The handmade piece is strung upon black silk cord. 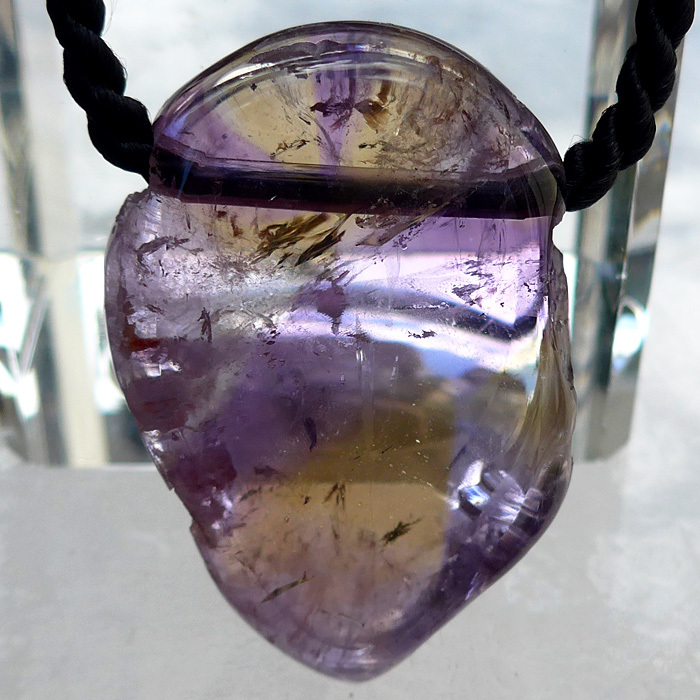 This Bolivian Striped Ametrine is all natural, totally untreated material. This is truly a rare mineralogical find, a collector's item and a Lightworker's power tool. This beauty really luminesces in sunlight. 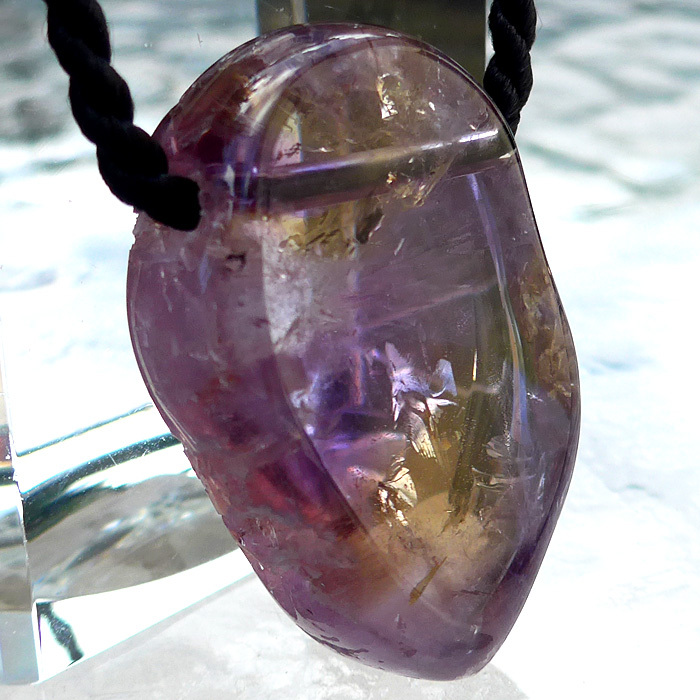 Lawrence fashioned this beautiful Bolivian Rainbow Striped Ametrine Pendant as a "Platonic" or "perfected" version of quartz forms found in nature. Thus this "biomorphic" pendant is somewhat irregular in faceting and in its overall shape, just as a natural crystal would be. To showcase the subtle beauty of this Platonic form of crystalline nature, Lawrence preferred to avoid any type of metal finding, bale or basket, simply drilling a small hole in the female end of the crystal for a chain or cord. The pendant comes with a simple black cord and a beautiful golden clasp, created by Lawrence to complement the elegant design of this unique pendant, complete in a velvet jewelry box for safekeeping. This Bolivian Striped Rainbow Ametrine resonates most powerfully with the vibrations of the Violet Ray and the Violet Flame of Purification utilized by the Count St. Germain to elevate the energy signature of the aspirant on the path of Spirit, making this stunning, beautiful pendant an ascension stone par excellence. 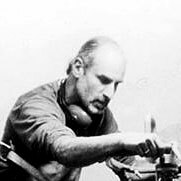 Lawrence Stoller was one of the first to explore the Anahi mine. "What is it like to be in a dense jungle, hundreds of miles from civilization, in a tight-chiseled cavern 200 feet underground, sweaty, dripping wet, hunting for crystals?" Lawrence asks, recounting his memories of that exploration. "In 1995, I was invited by a miner named Ramiro Rivera to meet him in the Bolivian jungle and there to unearth treasure in his ametrine mine," Lawrence recounts in his beautiful book, Frozen Light. "Ametrine is a recently discovered gem in which amethyst and citrine decided to lie down together, purple and gold united in the same crystal. . . .The mouth of the mine is a 100-foot vertical shaft. . .I head down a series of ten woven, vine-wrapped wooden ladders, submerged into the darkness. . .Air is being pumped into the hole, but there is appreciably less and less with every step deeper into the mine. Not enough room down here for claustrophobia. I didn't have it going in, but I've got it now." "Crawling on my belly through the tightest passageway, my white shirt's become painting in shades of red clay mixed with sweat," Lawrence continues. "Suddenly the limestone walls open into a chamber and I stand before a stream gushing through the cave walls at my feet. Affixed to the roof are thousands of crystals hanging like bats. . .I am no longer 200 feet down in the belly of the underworld.I am in heaven." This Anahi Bolivian Striped Ametrine is beautiful, very high energy old material and until now, has been held in a private collection until it was recently exclusively offered to Satya Center. 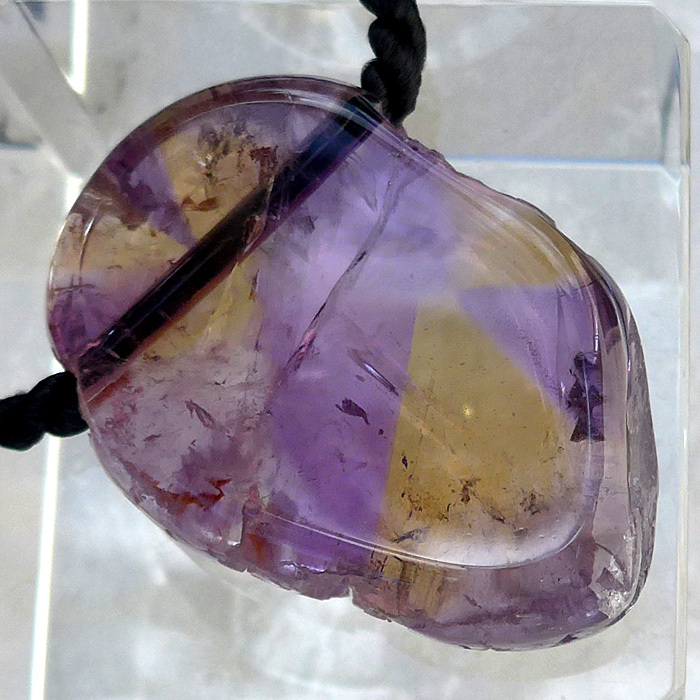 Visit our Crystalpedia to read about the metaphysical and mineralogical qualites of Ametrine. Note: weight above is shipping weight. Actual weight is .88 oz.